Can we detect love from a picture? This is the goal of our latest application: Deep Love for Android (https://play.google.com/store/apps/details?id=deeplove.app&amp;hl=en), which compares the pictures of two people to a database of thousands of pictures of long term couples. 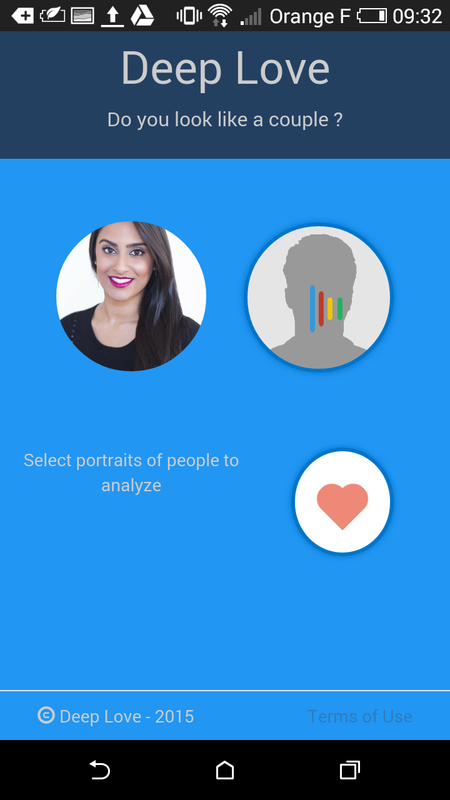 This application is based on artificial intelligence algorithms called "deep learning" or deep neural network, which allow a computer to automatically search the characteristics of couples, and then be able to find these characteristics in pictures submitted by users. The first phase of this work was therefore to collect a large number of portraits of couples, famous or not, as well as many pictures of "non couples", that is to say two people who are not in a relationship. This application, and the concept itself, are obviously experimental, and Internet / mobile users that will try their own photos through this application will then have the opportunity to contribute to this experience by providing their photos for future learning, indicating to the application if they are a couple or not. The application is free and unique, please try it and give us your opinion on the store.